Since way back (way, way back) in November 2011, we have been running a bit of a ‘different’ class on the Round 1 timetable. The whole idea behind ‘TANKS’ was to give people who wanted to lift some heavier weights in a structured environment the opportunity to do that exact thing…but after 8 years and 440 sessions, the session (s) this Saturday morning will be the final ones we run. In its place will be an exciting NEW class – ‘Barbell Club’. So – since the Strength gym opened back in December, what I have found is that there is a bit of an overlap between the new ‘Functional Fit’ classes and the existing ‘TANKS’ sessions. Sure – the ‘TANKS’ sessions ALWAYS include a big chunk of strength work (whereas Functional Fit does only ‘some’ of the time) so that is different…but at the same time ‘TANKS’ also includes a reasonable conditioning block (‘Living the Dream’) which kind of steps on the toes of the ‘Functional’ classes a bit. Basically, it has become a bit tricky for ME to describe the difference…and if I don’t understand it, how are you guys supposed to get it? I could have just left the class as ‘TANKS’ (and based on some of the website trouble I am experiencing right now I sort of wish I had!) but I wanted a NAME that describes the class “to a tee”. BARBELL CLUB. The new program will be a structured, THREE DAY PER WEEK program that is STRENGTH FOCUSSED. ‘BARBELL CLUB’ is intended to help you build foundational strength. You will squat, press (vertical and horizontal), deadlift, do pull-ups and row. 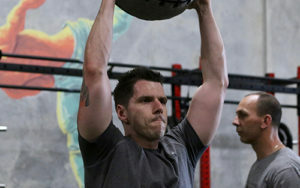 There will be some primal work – lunges, step-ups, power-cleans – a heap of core exercises, and CONDITIONING (think deadballs and kettlebells) rather than cardio. It is a NO FRILLS class for people who want to get stronger. In short, the ‘Barbell Club’ sessions have been designed to give you the strength, power and speed to get the most out of your training…and everything else you want to do in life! Tuesday 6:30pm, Thursday 6:30pm. Saturday 6am. This also means that the timeslot at 7am Saturday – previously TANKS – will become a ‘Functional Fitness’ session. The timetable will be updated to reflect these changes in the next couple of days. What about some morning sessions? BARBELL CLUB. Building a foundation of strength.